Last Friday, our team turned over to project lead Vic Wertz the first draft of the upcoming Pathfinder Adventure Card Game Core Set. This is a new type of box set, about which I'll go into detail below and in later articles in this series, which will run for the next year. Sometimes I'll write it, and sometimes you'll see the musings of the other members of our highly talented design team. It is not coincidental that this turnover came at the end of a highly eventful week for the Pathfinder ACG design team. As we began shipping our upcoming games The Ninth World and Thornwatch, the Lone Shark designers took the so-called "final" version (SPOILER: it wasn't) of the Core Set to PaizoCon, our favorite convention to run PACG at. At Saturday night's Preview Banquet, I revealed the not-at-all-surprising fact that we were making a new Core Set, as well the slightly bigger surprise that the next Adventure Path is based on the beloved Curse of the Crimson Throne. The Core Set can be played by itself, if that's all you want—its story content is based on the Pathfinder Module The Dragon's Demand—and we're increasing the replayability even over previous sets. But when you combine it with Curse, you'll have something about the same size as previous Adventure Paths. Importantly, you need Core for Curse, because the latter needs the former as a foundation to function. That's true for every adventure we want to make going forward. So when we produce another Adventure Path, or even perhaps a smaller adventure, you'll combine it with the Core Set and get an experience similar to Rise of the Runelords or Mummy's Mask. I described at the banquet how Core was basically done in design, and Curse was well underway. 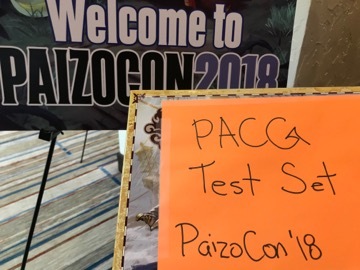 I described how both would release just before PaizoCon 2019, which made a lot of people there very happy. Me, for example. And then I went into why we were making it now, and really what we were and weren't making. Some of it supplemented this blog, but since it's a year later, I actually knew what I was talking about this time. So now I'll tell you. I would like to officially note that we are fully capable of making a Top 5 list that stops at five. This graphic has been on our design team's whiteboard for several months. Its goal is to remind us what we're doing and why. The most important element of this project is perhaps the least obvious: We want to keep making the game we've been making. Throughout my career, I've helped lead many reboots and expansions—D&D 3rd Edition, Axis & Allies, Attack!, and Betrayal at House on the Hill, to name a few. Each time I've started by spelling out how much we wanted to move the goalposts. That has typically defined whether we're making a new set or a new edition. As I've said for a while, we're not making this a "second edition." Our goal isn't to invalidate anything you have currently; everything you own for PACG is still good and will continue to be. What we are creating now will interlock nicely with Skull & Shackles, Wrath of the Righteous, Class Decks, and everything else that has come before. Some things are changing around the edges, including some important terminology. but as we saw in our PaizoCon playtests, people got those changes within minutes and were off playing without hesitation. Improving your character by acquiring better boons for your deck. Increasing your character's power along a linear arc, corresponding to an increase in the difficulty of challenges. Giving you a variety of ways to grow your character over time and make it your own. Letting you explore the world by encountering cards and dealing with their challenges. Doing so as a part of a cooperative team in an involving story. None of this is going to change. We're not adding a PvP option, dynamiting your role cards, or flattening out the power curve. These cornerstone principles had to be observed when considering any change we wanted to make. Fortunately, a whole lot of changes still fit under that tent. The game is a bit too slow in all phases: how long it took to set up, how long it took to take a turn, how long it took to tear down. We looked for solutions that sped up everything, even if we gained just a few seconds here or there. For a game set in one of the most expansive fantasy worlds ever made, we gave you too little story. The opportunity we had to tell stories was mostly limited to tiny boxes on the backs of cards, and conveyed very little of the depth the orignal storytellers had given us. Though we tell many different stories, the game often gives off a feeling of sameness. We did morph from only having a few different scenario types in Rise of the Runelords to having only a few "standard" scenarios in Mummy's Mask. But more can be done. Groups of players get varying experiences by group size. A solo character is less likely to run out of time and more likely to die; the reverse is true for large groups. While that's fine, giving people the ability to toggle those variables seemed smart. Many cards have complicated text. We've piled template upon template, sometimes requiring three or four powers on a card before we started making it interesting. Certain card types like armors and spells got burdened in ways we never envisioned. Some sets were easy and some were hard, but regardless there was no way to control difficulty. If you wanted to make the game harder, you were on your own. We will benefit from giving players controls for this. For a cooperative card game, the game is often not interactive enough. When you want to help your friend, the game generally tells you that you can't unless you have a card that does so. It's a co-op game, so it should feel more cooperative. In addition to a design team that has grown and learned from all our iterations of the game, we had three other resources to use to achieve some of these goals. None of them existed when we made Rise of the Runelords, but all had been successful in its wake. The first was the Pathfinder Society Adventure Card Guild, which showed us new ways to tell and organize stories. The second was Obsidian's Pathfinder Adventures app, which showed us ways to make the game sleeker and faster. The third was Lone Shark's second ACG, Apocrypha, in which we addressed a lot of these concerns. In the next installment of this design diary, I'll talk about how we used those tools to address one of those big challenges: injecting more story. Thanks for reading! The lack of story and interactivity are the deal breakers with my group. Adventures with little story and limited ways for the game to change based on how you progress. A cooperative game where it's optimal strive on your own unless you have an ability that specifically works when you pair up with someone. A shame because I love the character building and growth. Hopefully the new set will fix all this. Nothing hurts worse as a player than investing a lot of money in a cooperative game that none of your friends like. Looking forward to it. Looks like the "What's changing" header didn't get formatted as intended. I'm really looking forward to reading the blog updates over the next year or so. I'll be even more excited to see the new core set and subsequent adventures. It sounds like a lot of the suggestions that the community made have been heard and considered. Debbie Downer note: this blog conversation isn't showing up in the PACG forums (yet). This discussion thread seems to be outside of the three subforms of the Adventure Card Game (General, Rules, Homebrew). It isn't showing up anywhere that I can determine. Super excited to see what's coming. This also reminds me I need to be on the look out for a copy of The Ninth World and Thornwatch since I wasn't in on the kickstarter. This also reminds me I need to be on the look out for a copy of The Ninth World and Thornwatch since I wasn't in on the kickstarter. There will be news about that ... real soon now. Thanks so much for the update Mike! I'm excited to continue to read these designer diaries. My physical collection continues to grow, and I've spent many hours on the digital. One thought - I love the way the Obsidian app presents rare / legendary / loot cards. Some of that can't be done in physical form (ie curly flourishes beyond the card) but some might be possible. This heightens the sense of power growth in the app. My character goes from the standard edged cards to a set of rare, legendary, loot items. I have visual cues just in the card edge and appearance that this character is not to be messed with. And when I draw from my deck and see that flash of a gold loot item coming into my hand, I can't help but grin. The monsters aren't going to know what hit them. Keep up the great work man! I'm excited for what's coming!! Not just a blog post, but a whole series of them! Excellent. Interesting that the core set will be based on a module. Not one I've played, but it seems cool. I don't really understand how it will combine with the different adventure paths to come, but I'll wait patiently for news on that front. Thanks for sharing what your values are for this redesign. And yup, that all sounds about right to me. I'm particularly glad that you're moving in the direction of more story. I love the games that come with scenarios, that have you pull out a little book to fill in the situation and set the scene for the rest of the gameplay. It makes it feel like a real adventure. Can't wait for your next design diary! This is exciting. The Thornwatch part of course (and Ninth World...I want to like, but that double-P is probably going to scare me away), but also the core set. PACG is my favorite board game ever, and everything on that whiteboard looks like it will turn things up to 11. Paul Peterson? Nah, he's adorbs. Rats! I saw the title and thought this blog post was about designing the next generation of the Advanced Class Guide! I'm excited about most of what you describe here, but I have one concern... you list one of the challenges as "complicated text", and you list one of the sources for addressed concerns as Apocrypha. That is a game I REALLY wanted to love, but I have always been stopped by what I have seen best described as "an unscalable wall of keywords". Please find a way to make the text on the ACG cards clear without requiring the player to constantly refer to a glossary. without requiring the player to constantly refer to a glossary. Came here for that, too. 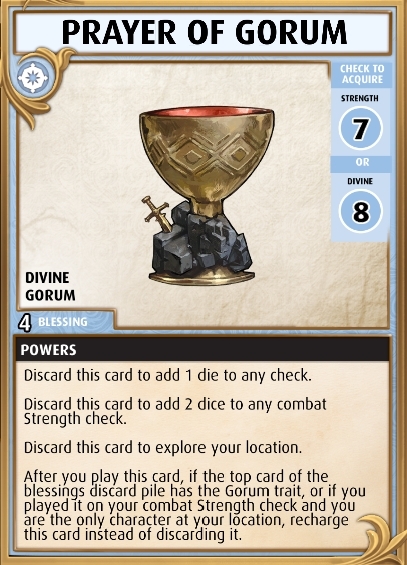 Apocrypha may never actually hit my table because of that (and its huge mechanical-flavor disconnect, a problem PACG before it didn't have). Someone else mentioned foiling some cards: please, no. Foiled cards don't shuffle well, wear differently, and, most importantly, can't be read except for the person holding it. I really don't see how this could be said. The game is a constant back and forth between characters/players to determine who's going to do what and help each other. I've seen very few co-op games more interactive than PACG. 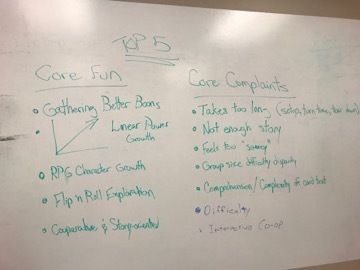 So I read the whiteboard and understood all the points except #3 in the Core Complaints column. What's 'somey'? I think that's "samey" (see the way the "a" is written elsewhere), meaning that (some people feel that) the overall game play feels too similar across most scenarios/adventures/adventure paths. This is a real problem. Posted in Website Feedback. I agree about an overuse of keywords, but after playing the game at PaizoCon in its (at the time) current form, I don't think they're going to be using TOO many keywords, and most of the ones they ARE planning to use are pretty intuitive for anyone who has played a game before. "Heal 1" means you shuffle a card from your discard pile into your deck. "Heal 1 from buried" means instead it comes from your buried cards. "Reload" might trip people up but you can very quickly figure out that it means top-deck. Overall, I think they're so far striking the right balance between too few keywords (meaning way too much complicated text having to be printed on each card) and too many keywords (creating a major barrier to entry). Thanks so much! I really look forward to the rest of this blog series. One of my favorite aspects of the game is the emergent narrative that arises out of the combinations of cards that randomly occur throughout playing. Some of the obvious are encountering a collapsing ceiling in the woods or defeating the shop keeper's daughter with a crowbar. I think that with even more story added into the upcoming products, there is even more potential for narrative depth. I've seen and experienced this with the PACG Play-by-forum that has taken off recently. It has allowed for much more roleplaying involved in the game. I also think, that while co-op is important, it makes sense for some characters to be more co-op friendly than others. People like Merisiel and Ezren don't get along well with others, but Valeros and Lem are super friendly! I do like the idea of better encouraging characters to stick together though, as it seems the default strategy for most scenarios is for (almost) everybody to split up to cover the most ground. I can see the issue with key words happening when it is right out of the box, pun intended. We can look to MtG as an example. Many key words had their detail text printed on the first or second set when they came out. Through game play they became memorized, so that in later editions they didn't need to be reprinted. I know when I tried to go back in a few years ago after leaving MtG during IceAge release, I was lost with all the new keywords. We have some keywords right now: Recharge, Bury, Invoke and the like. I seem to recall some possible new keywords as Heal or Bless. I can see a short hand for it being "If the roll invokes the Melee Trait, twice bless the roll." or "bless the roll twice." I am eager to see what methods are used to help streamline set up, as that has always been a momentum killer in my groups. As requested, here are announcements about The Ninth World releasing on June 20th and Thornwatch and The Dark of the Wood releasing on July 10th. As always, if you have questions about my non-Pathfinder games, you can always hit me on Twitter or Facebook. This is a place to discuss PACG. Thank you for the update! Looking forward to the updates! All very exciting news. Thanks for sharing the design ideas and taking feedback from the fans. Wait, so is the new set going to mothball everything that came before it? Will I have to buy all new character decks? I know the new kids cannot focus their attention on something more than 50 sec or so, but should we encourage them? I mean, seriously, if you want to feel like you are playing a knight, you should allow for a few turns to get into character. Especially in large groups were the game only last a few turns for each of us. My point : I would like the number of turns per character to be a little less scaling down with big groups. Boardgames are an opportunity to gather friends and spend time with them. It's OK to make a 2p game shorter in time. I have a somewhat different perspective on foiling, since everyone I play with (exclusively organized play) has their cards sleeved. Plus, i've been a big advocate in favor of exclusive cards for OP-only distribution, and foil loot cards as permanent rewards for OP attendance would certainly fit the bill. As for making the game more co-op, i'd be quite happy to see more cards be discarded to assist others on their turns. The balancing factor would be the narrowing of my own options on my turn. The whole structure of the ACG, which in general rewards splitting the party, has always seemed at odds with the "never-split-the-party" ethos of role-playing games. I imagine it is too late now to have that particular "bug" of the game addressed, since it does not appear on the list of core complaints. As a matter of fact, the playtest had a few changes that did encourage people to stick together. For one thing, there may be more cards and powers which explicitly can support 'local' checks (checks by characters at your location), but there was also a rule where, I think, if a player failed to defeat a bane then another character may bury a card to encounter that bane. Or it was something to that effect; I heard my details second-hand, I'm afraid. Either way, there was some means of other people 'stepping in' to help. Sounds promising, as long as players aren't punished for not covering other locations for temp closing. For example, it would be nice to have cards that would allow me to move to another location during an encounter, for temp-closing purposes, and then be considered to have moved back once the encounter is over. Or some other mechanic that allows us to "cover the exits" in a fight with a villain. This does add some interesting developments. Also then forces some characters like Merisiel to weigh the benefits of extra damage while alone versus the benefits of having friends along. Maybe future Rogues could have a power that would allow them to not count as local for bonus damage by them and other rogues sharing a location. Lets some rogues go tandem to help each other. Also, I could see some teleportation spells or mount allies that could help with location closures. Perhaps something that could be displayed to allow for moving to an open location during a Villain encounter and then discarded, or buried to return back to the previous location. Something along those lines. The key idea I was trying to get at was making unique boons like "Loot" feel more special in your hands by giving a similar kind of visual treatment they get in the app version. That could be foil, or it could just be a different border treatment. For example, "Loot" cards look like this in the app. And I would take the concept one step further and have "advanced" and "elite" boons. Maybe 3-4 per class deck? Or a special upgrade pack for an AP that includes some more powerful boons that match the flavor? Again looking to the app, "advanced" boons look like this, while "elite" boons look like this. If players were concerned about being overpowered, there could be something similar to the app's wildcard powers - such as shuffling and additional barrier into each location, or increasing the difficulty of acquiring boons by two. For me, this heightens what Mike has mentioned as one of the core "funs" of PACG - which is acquiring better boons. When I start getting these advanced or elite versions of cards into my hand in the app, I start feeling like the characters have seriously bumped up. These are no longer generic boons that look just like everything else. This is my hard won and unique treasure, and ONLY RANZAK HAZ IT! For Paizocon this year, for example, we had a set of rewards that pertained to the season we were playing and some generic rewards. You could get a reward that gave you bonuses to Undead (Silver Crusade), or elements (the Concordance), or to rescue allies (Liberty's Edge). You'd get 2 uses and gain bonus uses if you fulfilled certain conditions. I do dislike chase promos especially for attendance to rare events (Dragonborn character for Dragonfire, which was only available at Origins 2017, is the big one I can think of recently.) Not everyone can attend those events, so inevitably they get sold on eBay for profit. Lastly, the Organized Play Foundation that runs PFSRPG/PFSACG/SFSRPG and Paizo are separate entities. I can get the OP 'rewards' by playing privately at home and buying the OP scenarios to play. I'm talking about encouraging public OP by having boons you can only get by playing public OP. And i'm talking about actual printed cards (only available to people running public OP) not paper proxies slipped into a sleeve. I'm with you on chase cards, not a fan of one-time exclusives. 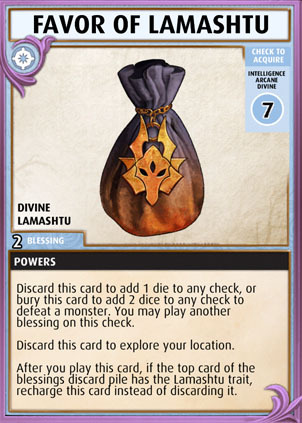 I'm imagining decks of "loot" cards and those cards are slightly better than the cards of the same level, but are handed out sparingly (appropriate to a players' builds) to OP attendees. I'm not talking about exclusive cards that are only available at one venue, and then are never re-printed. Another feature that would be interesting is if the story was printed on a stack of story cards and as you found henchmen and villains, you would draw and read the next story card. That would allow the story to evolve during game-play, rather than just reading text at the start and end of a scenario. Тhis means cards that people like me (who can't attend events) will NEVER get. And this is exactly the sort of $%it that turned me off buying computer games. If I'm being penalized for my location, or for the store I choose to purchase from - then my business is not good enough for you. Which means *your* business is not good enough for *me*. Honestly, I'm kind of the same way, though perhaps not to the same degree (especially because I play games heavily regardless). But being told "This is not available for you" because of my geography, or work hours, or anything to that result is a tough pill for me to swallow. I'm not inherently opposed to the idea, and certainly I have little issue with it appearing in purely co-operative games, for the most part. But it still can cause problems. There's a sort-of-MMO out there (which will remain unnamed) that gave, among other things, unique in-game products and boons for high tier Kickstarter backers. Whilst these boons and products were exclusively usable in a PvE setting (so they were clearly non-competitive), it didn't entirely solve the issue of it being 'unfair'... because these tiered backers could potentially grind faster and progress faster. They may be more desirable as teammates (of which you could only have a finite amount), so even when there's no obvious competitive element, there are still inferred or 'meta' competitive elements encouraged or enabled by the game that the existence of these products compromised, to a point. If I was able to purchase these boons/products myself if and when I decided they were worth it (and the game was enjoyable enough to justify the investment), I wouldn't really mind - I'm not opposed to microtransaction based models, at least certainly not for free games. But they were exclusive to Kickstarter backers, leaving everyone who missed the Kickstarter (or elected not to participate) being treated as second-class players. For the most part, I don't have a big issue with seeing custom rewards delivered in PACG, to a point, but I'd greatly appreciate such an idea is handled with care. If you're going to release a special boon (lets say, some promotional boon) or reward it to people, can that boon be otherwise released down the line? Could it appear in some product 6 or 12 months down the future, even if it has different art or lacks the same 'flashiness'? If it's a non-material reward (like the ability to use a certain character in Organized Play), is it also available through online events? The Promo goblin characters are timed-exclusives to subscribers, for example; that's a good solution that I have no problem with. If they were a situation where "You get this character by attending this convention or being a subscriber, otherwise you can never get this character and too bad if you just got into the game and you like the look of them", then I'd be upset. Fortunately, I don't really see that as happening with how Paizo and Lone Shark treat the PACG product line. TL;DR: I have mixed feelings on the idea of anything reasonably 'exclusive' or 'promotional', but I'm willing to be tentatively optimistic about them if they're handled carefully. I've been burned by such an idea before, and am speaking from a position where physical PACG event attendance is all but impossible 100% of the time. Yep. To some there Are no any means to partisipate OP. I don`t personally maind special version of card as a reward if there is a easy way of getting normal version of it otherwice. But any event spesific that can not be accuired in any other way... Yep those Are bad. Some games have full art versions of spesific cards and those works fine. It is something special, but you can play with normal versions just as well. The closest they got to this is a boon that unlocks Arueshalae for OP, which was a convention exclusive reward. I've already requested Arueshallae be made publicly available to OP, in a different manner. There's a fella in our group who would be OVER THE MOON happy with this if it comes to pass. He has not. stopped. asking. about an Arushalae unlock since hearing about it, what, two or three years ago now? I would also be thrilled with this. Just want to chime in a little as someone with a board game background, because I know the majority of ACG players have role-playing backgrounds. What's coming sounds good; I like the idea of more integration and less of an investment for people to get started. I'm ok with more story though I don't see it as a need; the idea of cards you read as the game progresses sounds interesting. Our OP group has several non-RPGers and we rarely read the story at the beginning of the scenarios (when it is read I don't remember it later, but that's partly because I'm usually setting up locations). And I echo the feeling that it's plenty cooperative already. Even the idea of individual characters going to locations they have the best chance of closing is a cooperative mechanic. PACG and my other favorite coop game are my favorites because there is a lot of individual exploration/discovery of specific encounters that you roll to resolve. So I'm hoping none of the individuality of play goes away. ... I know the majority of ACG players have role-playing backgrounds. I'll opine that my impression is this is *not* the case. The opposite, actually. It's the rare RPGer that crosses over into the 'Pathfinder-lite' version that is the card game (in my completely unscientific sampling). That said, yours is interesting take, because it's so unlike mine. IMHO PACG is not very cooperative at all. I enjoy playing it (obviously :) ) but I am completely in favor of more cooperation. The RPG Rise of the Runelords Adventure Path has such an interesting story that I splurged on the anniversary complete-path book just to read it (although I don't play the RPG). I would like to see more of these rich stories presented in PACG. Although I'll admit my gaming groups long ago stopped reading aloud any of the current story-like elements (I'm embarassed to admit). I'm an avid ACG player who's never played a tabletop RPG, but I also love the story elements. I also picked up the RotR anniversary edition to get a more complete story, and just recently picked up the Pathfinder Legends audio book things. We just finished adventure 2 of RotR in Pathfinder Legends, and I'm really enjoying it. I'm not an audiobook person, so I was a little hesitant, especially because the sample they have for RotR combines bits from various story parts, so it doesn't make a lot of sense on its own (the sample for MM is better), but they're fabulous. They're telling the story of Ezren, Meresiel, Valeros, & Harsk as they adventure through the RotR story. That said, one of the things I love about PACG is that the story isn't required. I love the story, but if I'm playing with people who don't care, the game is still fun. 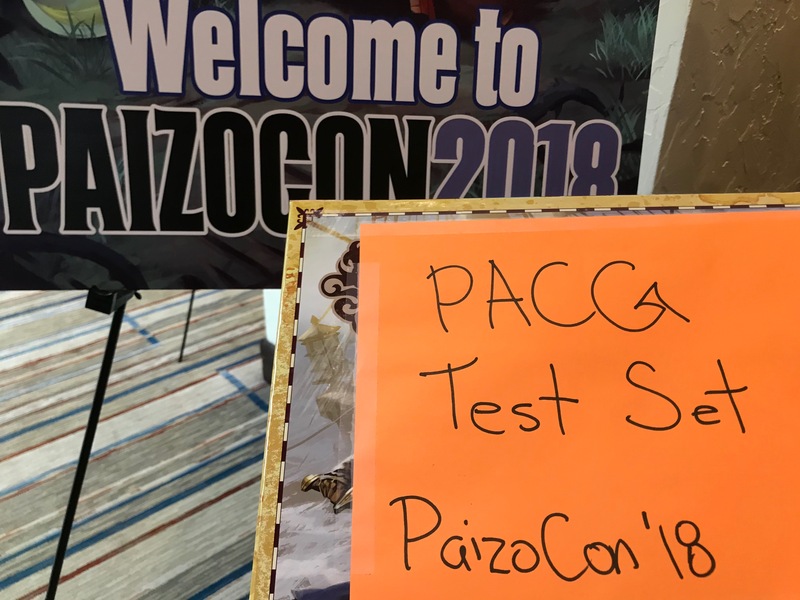 From what I saw at PaizoCon, the playtest doesn't change the feeling of PACG. It encourages you to group up (more characters & cards can add bonuses to local checks), but doesn't really penalize you for not doing so. If anything it gives you more options for other people's turns, without really taking anything away from what you can do on your own turn. Yeah, just anecdotally; I'm a big card game player and that was my opening into Pathfinder ACG. Whilst I've certainly played my share of tabletop RPGs in the past, I've never played the Pathfinder RPG nor do I have a particularly strong inclination to (nor any Tabletop RPG right now in my life, more accurately). I've personally gotten 4 more people, to various degrees, into the Pathfinder ACG, and none of them play the RPG, and 3 of them have never played tabletop RPGs full stop. It's all purely anecdotal evidence, of course, but my stab-in-the-dark opinion is much more akin to elcordude's than Pezkat's. Anyway, with that said, I DO love a good story. I used the fan-made Adventure Guides through all of my runs through the PACG sets, though I found myself far more invested in some than others. I also really do enjoy the storytelling in the Organized Play scenarios, especially with the ongoing play-by-posts giving me a chance to flex my creativity with flavor text. As much as I really like the Class Decks, it feels like they also create a disconnect from the scenario & storyline being played. Your hero finds an Ankh of Awesome in the game, but then needs to swap it out with a Spyglass from the Class Deck. It's like Class Deck players are involved in playing a parallel game that aligns with the other Heroes that are playing from the box. I understand the idea that a person can show up with their Class Deck and leave the game without affecting the card stock of whomever owns the Big Scenario Box. I'm not sure that having Class Decks is worth sacrificing the connection In-Game Characters develop as part of the world they're exploring.